But today seems like a good day to break my politics-and-knitting-shouldn’t-mix rule. It’s been just over a year since Trump’s inauguration, and (not really coincidentally), a year since the first Women’s March. 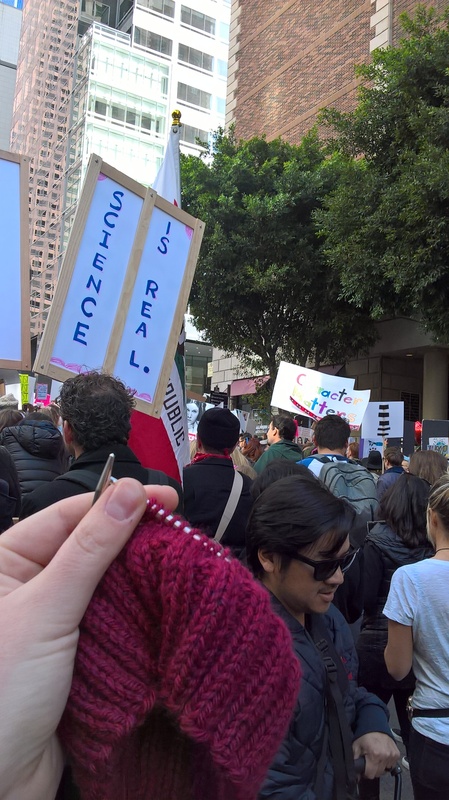 Last year, I got to march with my friends down in LA, where I knit and distributed a whole pile of Pussyhats. Unfortunately, I wasn’t able to make it to the march this year, but you better believe I was there in spirit. And I made sure towear my hat from last year all day (it’s the one I actually finished while marching last year). The last year has been filled with ups and downs of all varieties- issues with taxes and immigration, the widespread acknowledgment of sexual assault in, and questions of women’s healthcare. But, there’s one story that’s been giving me a ton of hope lately. 2018 is an election year, and an important one. Control of both the House and Senate are going to be very tightly contested (heck, the Senate is currently held by the Republicans by only 1 vote! ), so this will be a situation where every vote really does matter. And, with people starting to line up to run for office (state and local office, too- not just national), people have started noticing something amazing. Women are stepping up to run for office in unprecedented numbers! If you agree that more female representation in government is a good idea, you might want to take a peek at two groups that are helping women who want to run for election (from local office all the way up to national positions). 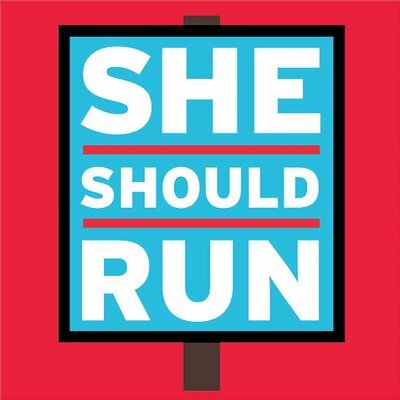 She Should Run is a non-partisan non-profit that gives women the resources, knowledge and networking that they need to run, regardless of their ideology or party affiliation. They encourage women to actively participate in politics and run for office, something that historically, women have been discouraged from participating in. Emily’s List is a Democratic pro-choice group that works to give candidates the resources they need to mount successful campaigns. In the last 15+ years, they have run hundreds of trainings for women interested in making a change in their communities and helped many campaigns become successful. If you’re someone who thinks pro-choice issues are important, you can even go onto Emily’s List and look for your local candidates to see if they’ve been endorsed. Anyway, I suppose it’s time for me to get off my soap box. Don’t worry- my next post will be all about how I can’t stand working with tiny needles, or how my blanket is not growing nearly as fast as I wish it would. Did you make it to the Women’s March this year? Are you planning on voting in the November election (or are you running!)? This entry was posted in About the Blog and tagged election, emily's list, politics, running for office, she should run, women's march on January 22, 2018 by onemilljellybeans.